In September of last year I wrote a blog on disability access, based on my experiences then traveling in an increasingly disabled condition. 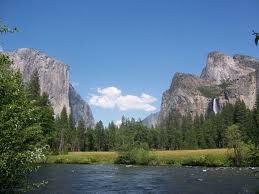 Yosemite Park. It really is this beautiful. physical limitations. My most recent trip long trip was to Yosemite National Park, a place that my partner Susie and I love and have visited many times in our many years together. This time, Susie had reserved an accessible room at the lodge. As we drove up to the entry station, we were unable to locate the free disability access park pass that I had acquired last year when we visited the park. But the Ranger issued another pass immediately, I guess because he saw the wheelchair we had in the back seat in case I needed it. We were surprised and delighted when the ranger also handed us a guide to disability access in the park. It seems that the National Park Service is paying at least some attention to the needs of people with disabilities who visit. We drove through the western end of the park to the lodge so Susie could register us at the Lodge, where we were staying. to which we were assigned, are on the outer edge of the motel-type units. That’s a long commute to food, to the front desk, or to the shuttle bus that can be used to visit park sites on the Yosemite Valley floor. When we got to our room, we discovered that there is no way to turn on an interior light when you walk in the door. There are lamps on each side of the bed, but they are across the room. There is also a ceiling light in the center of the room, but its control is a pull chain that is too high to be reached by anyone in a wheelchair. We also discovered that electrical outlets were in very short supply and not really accessible. There were a total of 4 outlets that we could find: Two were behind the bed, one was behind a huge set of drawers, and one was at the vanity. None was reachable from the one working surface unless you happened to bring an extension cord. All but the one on the vanity required that we get down on our hands and knees to plug anything into them. Seems like the electrician had the day off when this room was made accessible. anyone who uses that seat. The towel hooks are set low enough to be reached by someone in a wheelchair. Lighting in the bathroom was another matter. 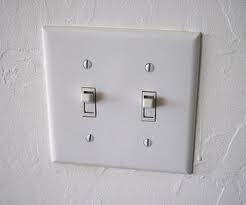 The switches that control the bathroom light are placed behind the bathroom door. 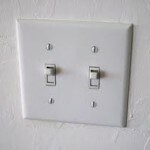 So unless there is enough light on in the bedroom to cast some illumination into the bathroom, you have to feel around in the dark to turn on the bathroom light. We looked for an electrical outlet which would have been useful if we happened to travel with a plug-in night light, but there was not a single one in the bathroom. 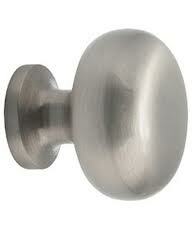 It would also have been helpful to have more grab bars in the bathroom, one on every wall. On the other hand, the closet place for hanging up clothes had the bar for hangers set low enough to be reached from a wheelchair. It also had those “theft prevention” hanger hooks that would be hard for anyone with hand mobility problems to manage. All of the public spaces at the Lodge have door buttons that automatically open doors. And most of them worked most of the time. 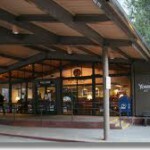 None were in evidence at the entry to the Ahwahnee Hotel. On the other hand, public bathrooms at the Lodge are not easily accessible. 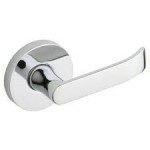 There are no buttons to open the bathroom doors (which, in my experience, is common failing with public bathrooms). There is an accessible bathroom in the lodge with a lever handle, but it’s not posted as accessible for some reason. been noticing lately how the sign does not always mean what it’s supposed to mean. 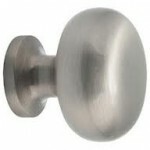 At a bathroom marked accessible for people with disabilities at a restaurant in Albany,California, the door knob was round, a shape not conducive to access. 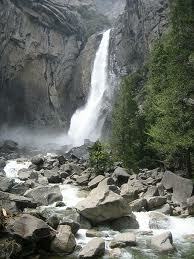 Lower Yosemite Falls. Everyone can get this close. 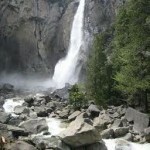 keep park lands in their natural state, the Park Service has built a wonderful accessible path to one of the central features of the park: Lower Yosemite Falls View. snowshoes. There is a road that is closed to the public. But with a disability tag for your car, you can drive the road and see the lake. 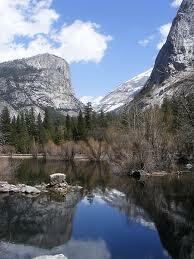 And, of course, if you look up, you can see the granite walls and features that what give Yosemite its magic feeling. 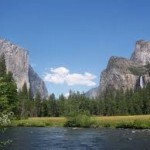 Being the kind of people we are, we sent our list of the good and the bad to accessibility officer at Yosemite. That person’s email address is yose_accessibility@nps.gov. We got a quick and encouraging response to that communication. However, I got no response to my request to be kept posted on changes made at the park. I guess I’ll do something about that when I get back from our next trip. My next trip is to Smith College to accept a Smith Medal for my breast cancer work. During the festivities, the documentary Pink Ribbons, Inc will be shown to the college community. This film, on a topic near and dear to my heart, may be a theater near you soon. Check the website of the U.S. distributor for screening dates in this country. In Canada, the film is already in theaters. Get your tickets early and tell all your friends. 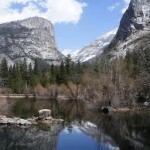 This entry was posted in ALS, Disability, Health Policy and tagged First Run Features, Inc, Mirror Lake, pink ribbons, Smith College, Yosemite, Yosemite Falls, Yosemite Lodge. Bookmark the permalink. This is a great blog! 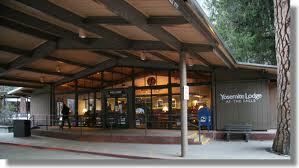 My parents took my siblings and me to Yosemite in the early 60s and I remember, in particular, Tuolumne Meadows. It was so beautiful and I always have associated that with my mother who was a natural born rockhound. I often wonder about these parks and how accessible they are to people. Washington state has fantastic trails that are as accommodating as anything I’ve seen (in BC we barely invest in park infrastructure unless it supports a logging road). The trails start out paved, then the paving ends and it’s smooth gravel, then the smooth gravel ends and it’s rougher, and gradually gets stepper as well. This means that most people can go as far as they can on the trails depending on their ability to navigate them. I was also hiking in BC once when I came across a guy in sort of a wheel barrow type of thing being pushed by his very athletic looking buddies up to the summit of a sizeable mountain. Everything should be done to support access to these beautiful natural wonders of the world. We love Yosemite! We had the opportunity to live in Northern CA for two years (in the East Bay) and traveled with our 3 children as much as we could. Yosemite was a can’t miss and we are so glad we didn’t . In fact, we are now considering moving back to the East Bay when my husband retires to his second career. Years away, but CA really dug its hooks into us and we can’t wait to go back!